Eli has been having some fun with the latest Climate of the Past mistake, by Lüdecke, et al. Although the Rabett's first thrust was about the data used, after all, if the data is bad, it doesn't much matter about anything else, others have been busy piling on. Except for the names of the authors is there anything else in the paper which is correct? Sadly no, but the number of things wrong with the paper is astounding. 1) The temperature series they use are not global. Worse there are other proxy and instrumental series directly "next" to the ones chosen by Lüdecke that look different. 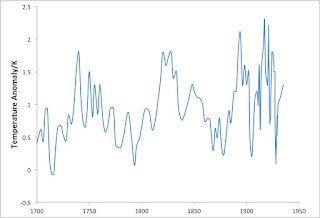 The characteristic of these records, namely the pronounced minimum around 1880, is equally found in Antarctic ice core temperature data, which are also overall in agreement with M6, revealing this 1880 minimum as a global phenomenon. In Georg's words, putting together a regional time series and then comparing it with a single proxy record half way around the world does not a global time series make. Surely the Editor, Eduardo Zorita should have caught this, given that he intervened against the advice of his referees to publish the paper, but, sadly no, he did not. 2) Even if that were not so, using their method to construct a global series, is, of course nonsense. Even a dumb bunny knows that. 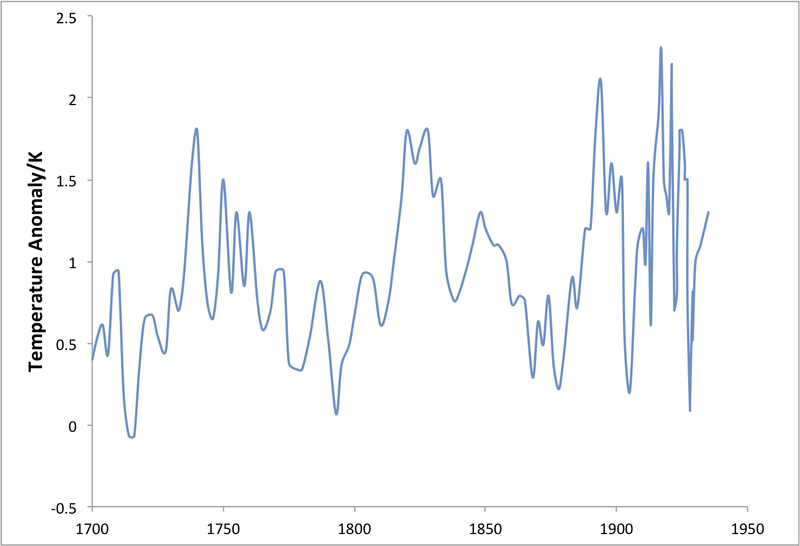 3) Their time series have at the beginning a strong and well-known bias to warmer temperatures. This bias controls the oscillatory behavior of the supposed curve. As Eli and Georg point out, the late Reinhard Böhm had figured out how to correct for this, publishing the result in 2010 but sadly no this was not taken into account by Lüdecke and the Editor, Eduardo Zorita, who again, amazingly enough, is working with the HISTALP project on a major paper. 4) Even if that would be not so, one cannot say anything about the dynamics of the climate system using Fourier analysis where the major alleged oscillation is of the roughly the length of the time series. Let me elaborate. All they’ve done is model the data as a low-frequency Fourier series, then compared that to the low-frequency (boxcar filtered) version. Of course it gives a good match, especially since the actual trend present in this data is dominated by low-frequency fluctuation. In essense, all they’ve shown is that an arbitrary function can be modeled by a Fourier series. Really. Truly. That’s all. With six (actually eight, but they threw out a couple which had zero coefficients) frequencies from the Fourier analysis and three parameters per frequency there are eighteen choices, nineteen if you throw in a constant. Von Neuman could fit an elephant with four and make him wiggle his trunk with five. Who knows the magic that could be done with eighteen or nineteen. But again, sadly no, the Editor, Eduardo Zorita did not pick up on that either, or rather he tried to wash it away. 5) The bumps and wiggles determining the oscillations, have known and not only cyclical causes (eg volcanoes). The agreement of the reconstruction of the temperature history using only the six strongest components of the spectrum, with M6, shows that the present climate dynamics is dominated by periodic processes. It additionally occurs to me that the form of the SP12 proxy, from which L. wants to draw conclusions about the 250 year period is not shown in the paper. Perhaps that has something to do with the fact that it does not display the assumed V form. Zorita was quoted in the Wall Street Journal as saying that the "scientific debate [on climate change] has been in many instances hijacked to advance other agendas", and that climate science students are "often tempted to tweak their data so as to fit the 'politically correct picture'. " It is interesting to read the discussion after the paper, especially this lovely snippet: "What matters is that the periodicities (no matter what causes them) explain the temperature history without assumption of forcing by CO2". Key is the word "explain". They do think that after fitting, the fit "explains" the data. Words fail me. in parody of Spencer's 3rd order polynomials applied to the temperature records for "entertainment purposes" - as Roy was wont to hedge. Having seen the hilarity that the Lüdecke et al toilet paper has spawned I stand by my original observation. [I think therefore I am not a robot. They must be doing it, since our ideology tells us their results are impossible -- so it's okay for us to tweak our data to defend our ideology, since it appears not to be able to defend itself in the, er, marketplace of ideas...."
"You would think that Lüdecke and the Editor Eduardo Zorita would know that..."
It is time for j'accuse! These people are NOT making 'mistakes'. They are lying their *rse off. Please change the vocabulary accordingly! rab: When I got this reply I kinda knew that these guys will never get this thing published (given the name of the Journal contains the word "Climate"). Gosh ... what a stupid bunny I am ... should have known that at least one "honest broker" is involved. So now he's a claimed meteorological instrumentation expert ? /edit he was also supporting the Bogdanov brothers ??? Damn, some time to revise my ranking, he becomes quite close to the Monckton place. DAMMIT! Don't say his frickin' name! He's like Betelgeuse! Recall Zorita bemoaning his fate as a mere scientist and postdoc while others grabbed fame and great fortune (tenure) for plotting the Gretzsky stick. Sour grapes. If I recall correctly a subsequent three repetitions of the offending name were also the cure. "Hot potato, orchestra stalls, Puck will make amends." [I think, therefore I am not a robot. Their science-technology section could use some climate science suggestions -- general take for the site is: true news stories that you really would have thought were Onion satire, but sadly, no. > Don't say his frickin' name! He's like Betelgeuse! The real question is whether this is a design flaw in the process @ CoP or a quality control breakdown in this particular case. If the former, then this will happen again until something changes. IF you know any of the editors, ask them politely what's going on. The editors claim (at primaklima) that the reviewers accepted the manuscript. Eli, your post states that the editor overruled the reviewers. Do you just mean the comments at Climate of the Past, or the official (anonymous) reviewers? Even if the editor overruled the reviewers, I would say that the authors are responsible for their article. I think it was a mistake of CP to publish this article, but the main fault lies with the authors. Victor, you can just read the reviews, both are at CP's web page, Discussion page. I know that Fanelli's Nature World View suggestion is principally about journal research article publication, but I could be persuaded to go beyond that to include all distortions made in public by scientists about their research or someone else's, whether that be in press releases, blog publications, or whatever. "... a good start would be to redefine misconduct as distorted reporting: ‘any omission or misrepresentation of the information necessary and sufficient to evaluate the validity and significance of research, at the level appropriate to the context in which the research is communicated’. Some might consider this too broad. But it is no more so than the definition of falsification used by the US Office of Science and Technology Policy: “manipulating research materials, equipment, or processes, or changing or omitting data or results such that the research is not accurately represented in the research record”. Unlike this definition, however, mine points unambiguously to misconduct whenever there is a mismatch between what was reported and what was done. The main task of journal editors and referees would then be to ensure that researchers comply with reporting requirements. They would point authors to the appropriate guidelines, perhaps before the study had started, and make sure that all the requisite details were included. If authors refused or were unable to comply, their paper (or grant application or talk) would be rejected. The publication would indicate which set or sets of guidelines were followed. By focusing on reporting practices, the community would respect scientific autonomy but impose fairness. A scientist should be free to decide, for example, that ‘fishing’ for statistical significance is necessary. However, guidelines would require a list of every test used, allowing others to infer the risk of false positives. Carefully crafted guidelines could make fabrication and plagiarism more difficult, by requiring the publication of verifiable details. And they could help to uncover questionable practices such as ghost authorship, exploiting subordinates, post hoc hypotheses or dropping outliers." Only the plagiarist, apologist, and omission-by-the-buck specialist need be worried. Scientific integrity is no longer confined to the hallowed halls or the erudite publications, and those comprising the ethics committees of the universities, grant bodies and so on should be more proactive in policing the public utterances and behaviour of their scientists. The Letter Elsevier Should Have Sent Roger Jr.